The circuit below expands the battery voltage monitoring scale for a 12v battery so a more accurate voltage reading can be made. The numbers printed onto the face of a standard 0v to 5v meter are changed so the scale ranges from 10v to 15v. 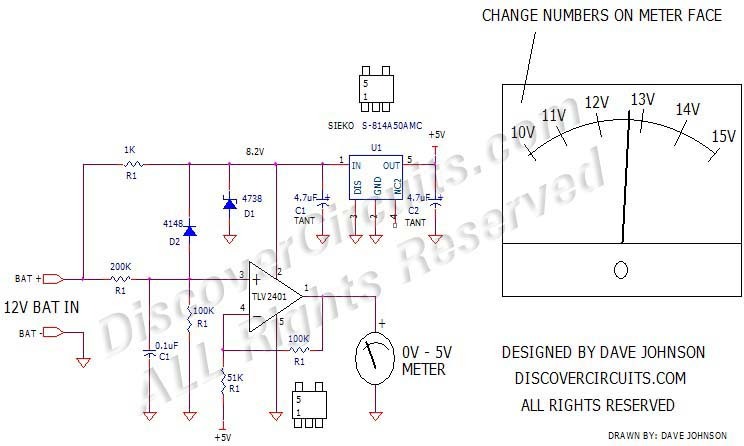 The circuit uses an operational Amplifier and a voltage regulator to perform the level shifting and rescaling of the battery voltage so the output varies from 0v to 5v with an input voltage of 10v to 15v.